Everything you need to get started will be posted on the "Bio. 100 Restricted Access Page." Registered students can find the password on Blackboard. 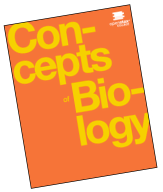 OpenStax College "Concepts of Biology. This is a FREE, open-source textbook. You can read it online from any web browser, download it, print it, or get a fancier, optimized e-book for your laptop or mobile devices for less than $5.